While it feels like only yesterday when we were celebrating National Avocado Day, it turns out the obligatory follow-up to the millennial-baiting "food holiday" is nearly here. National Guacamole Day is Sunday, September 16, and it may actually be worth recognizing, thanks to a long-overdue menu update at Chipotle. On Friday, the burrito purveyor announced plans to celebrate the occasion by unleashing a new, significantly larger side of guacamole -- and it might actually be enough to get you through the whole bag of tortilla chips. Specifically, you can now choose between the new 8oz side of guac and the existing 4oz serving, when you order it with a large order of chips or by itself, according to a press release. The new option is already available at most Chipotle locations. In a statement, Chipotle Chief Marketing Officer Chris Brandt all but admits the regular 4oz size just isn't enough guac. "Guac has long been one of Chipotle's most beloved items," he said. "In fact, customers order nearly 50 million pounds of guacamole from our restaurants per year, and we use more than 450,000 avocados in our restaurants every single day. Many of our customers can't get enough of our guac, and we're thrilled to give people even more options to get their guac fix." 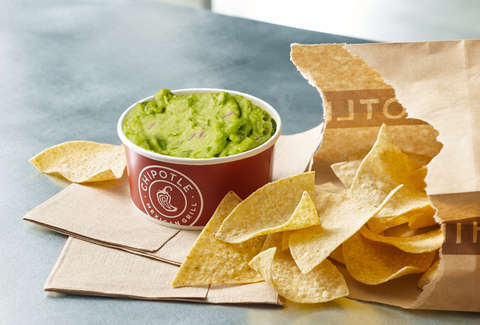 Chipotle didn't mention how much a large side of Guac will set you back, but a quick glance at the chain's mobile app revealed you can get a large chips and large guacamole for $6.75 at locations in Manhattan (the price may be different in other areas, though), which is a lot for a side in addition to your $8-$10 burrito. But on National Guacamole Day, it may be worth it. Celebrate responsibly.